Great post Greg. I agree with you 100%. There is a space for softswitching, but in the larger picture I think that more is needed. 802.1Qbh is in my opinion a great solution, I am glad you pointed it out (VM-FEX is a pre-standard implementation). One other angle you hinted at but did not mention explicitly is the operational component: “Managing” a network is more than provisioning. 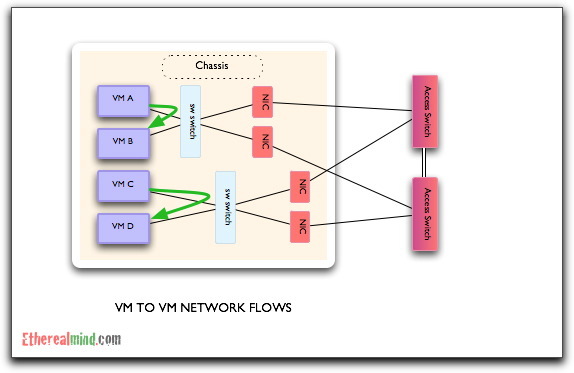 Often times, softswitching solutions tend to highlight the provisioning simplicity as they can integrate with hypervisor management easily, but what about troubleshooting, visibility into the network, performance management, fault management, etc. Yep. Software is cheap and stupid. And in IT – cheap and stupid always wins. Plus, the hypervisor vendors can market the “integration” with their products as a feature – while carefully not pointing out that it has a number of design defects overall. Well, yes. The most recent example of this is the use ARM chips compared to x86. The x86 chipset is simple and cheap to use, but long term outcomes have not been good. Now that ARM using a RISC style instructions shows that hardware and software have a complex interplay. The current trend to deploy in software is only temporary until the industry stabilises, and over time will return most functions to hardware – again demonstrated in GPUs for graphics rendering. Don’t let a burst of enthusiasm for the latest fad to stop looking at the long term outcomes. I believe the curve you are describing has a longer tail than what you predict. I (personally) believe we have just entered into the “software” curve and I am not sure we can predict when(/if) we will exit from this. For the good and the bad IBM is an interesting benchmark of this trend (only because they have been around for long enough to see a pattern). They used to be a HW company (with basic software/microcode) and one could arguably say they are more of a software (and services) company at the moment given hw is becoming cheaper and more stupid. Coincidentally I have raised many of the arguments you are using to describe (in 2001) the issue we were introducing with software virtualization to virtualize x86 servers. Well we know where we ended up with… and I haven’t seen organizations going back to x86 physical because it’s more “secure”, more “scalable” and could deliver more “performance”. It could be just my feeling but I see a lot of commonalities between the 10 years old server virtualization trend and the new network virtualization trend (of which software switching is a small part)Will this be a failure? Hard to predict … the good news is that, most likely, I’ll be retired by a long shot when(/if) that happens… and I am 39. My 2 cents. Massimo. Sorry I forgot to mention that I work for VMware so you have a right to consider my thought biased. I remember that VMware really only became successful when the Intel CPU added virtualization extensions. Same applies for networking, software is a quick & dirty fix that will give way quickly to hardware/software interface is the only real solution when you get down to this type of functionality. The IEEE, via the VEPA standard, understand this. Problem is they are too slow to get something out the door and software will fill the gap. The software is really only a gap filler and isn’t fixing the underlying problem. I disagree with this. I have been working with VMware technology since 2001 (although I have joined the company last year) and I can testify that Intel/AMD adding virtualization extensions didn’t change anything in terms of the success of it. Also that is a very small piece that is not at all representative of the big gains/losses of implementing something in HW or SW. The advantage of virtualization is really in terms of the flexibility it provides (workload mobility, high availability, disaster recovery, speed-of-deployment, better management etc etc etc). Something that you just “cannot” implement in hw. This has nothing to do with the optimization of where an x86 instruction is being executed (in hw or in sw). Similarly the key question is not where a network packet switch occurs (in a virtual switch or a physical switch) but it’s rather the advantage of decoupling hw from software and everything you are allow to do when you get to that state. Yes a lot of customers will trade-off (some) performance benefits to get to that state. This isn’t very difference from the performance penalty they have compromised with in the last 10 years virtualizing their servers (with or without the CPU virtualization extensions). I’d disagree with that view. The CPU extensions were key inflection points in the adoption by enterprise because it addressed security and performance limitations inherent in the software only solution. You can’t dismiss this so blithely and pretend that software is the only answer – for infrastructure, software is always a short term fix, and addressed with hardware support later where scalability and reliability can actually be achieved. For example, VMware is not developing their fourth generation of virtual switching – and yet very few people are happy with the products released so far. It does not seem that software can solve the problem in this case. >The CPU extensions were key inflection points in the adoption by enterprise because it addressed >security and performance limitations inherent in the software only solution. >For example, VMware is not developing their fourth generation of virtual switching – and yet very few >people are happy with the products released so far. It does not seem that software can solve the >problem in this case. Seriously. 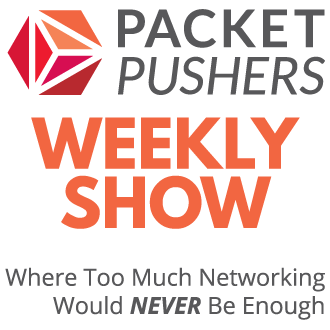 Networking in VMware is simply awful. No possible defence in how bad it is. It uses split horizon as it’s most advanced feature. This is your blog. You deserve the last word. Isn’t vApp supposed to prevent your exact scenario from happening? i.e. 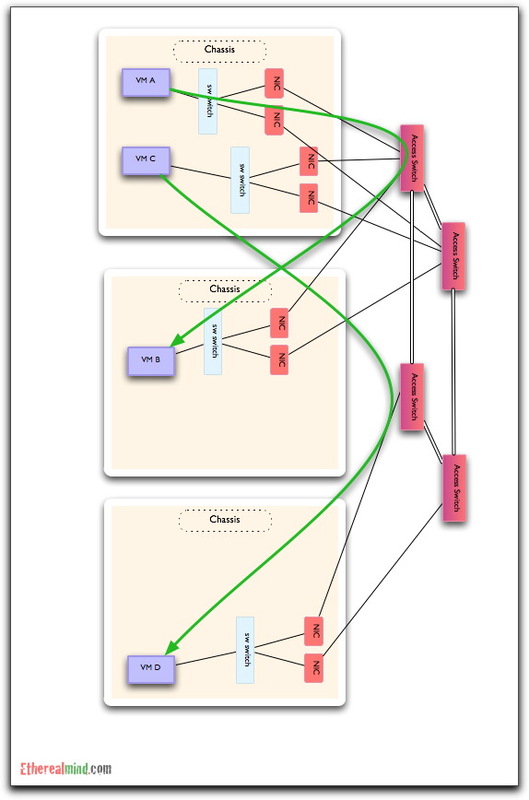 your Apache and MySQL VM would be in a ‘vApp’ container, maintaining hypervisor affinity. If they need to migrate, they both migrate together. This is exactly the sort of half arsed workaround I was referring to. While you COULD do this, it doesn’t make strategic sense to do this. What happens when you need to separate them for performance reasons ? Or because you want to even out load in a cluster ? What happens when peak load means the only solution is to split them into separate VMs so they don’t damage each other’s performance ? While you CAN do this, you SHOULD NOT do it because it’s a deadlock design that’s dooms you to failure in the wider picture. The one comment I would make is that most virtualization implementations I’ve seen are memory bound with idle CPU resources, even at peak load. No, vApps do not maintain hypervisor affinity. You may use DRS rules to implement that, if desired. To say software fails at scale is misleading. Software will always scale better than hardware at all things except performance and possibly cost. There is always a cost to using hardware switching to get that performance. Hardware is much less flexible, very difficult to add new features without replacement, fixed scalability, and complicated deployments. 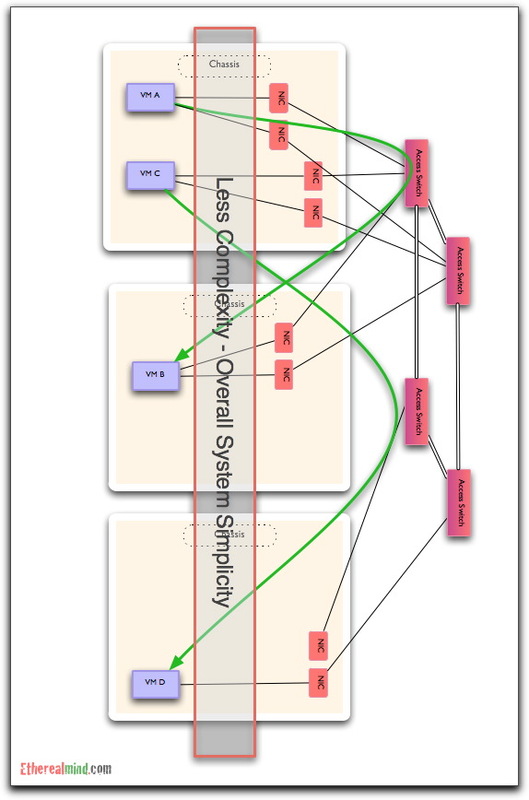 I say complicated deployments because nobody upgrades all hardware at once, so over time the hardware variants, feature inconsistency, and scale differences become a huge complication. In physical switching say between 48 ports of 1Gb, the performance difference between a hardware and software implementation is so great that it easily makes sense to go with hardware. In the case of an SR-IOV nic, the performance difference is fairly incremental. You could have easily written an article that said hardware VM switching fails at scale since most SR-IOV nics only support a fixed number of vnics, upstream switches only support a fixed number of vnics, the number of TCAM entries for ACL, QOS, etc. are fixed. In the end, both models need a software overlay control plane to address VM mobility and automated placement across racks (move the policy and state along with the VMs). I can see how it can be done with software switching. It will be interesting to see if hardware switching will be able to handle this when the hardware versions, number of vnics, etc. change over time and need to be considered all within the same network. The security argument is misleading as well, nothing is absolutely secure. The question is it secure enough ? The message implies that SR-IOV is more secure than software switching which is false. Software can be equally as secure as SR-IOV. In the end, the argument of whether to use software switching or hardware switching really boils down to whether you want flexibility (in terms of feature sets, scaling, and feature consistency) or performance. Except that the hardware exists and is proven. Hardware doesn’t need to be flexible for frame forwarding because the data doesn’t change often i.e. IPv4 has been stable for twenty years, Ethernet for at least as long. Software flexibility doesn’t apply to static data sets. “The message implies that SR-IOV is more secure than software switching which is false. Software can be equally as secure as SR-IOV. ” Well, it COULD be – but time has proven hardware approaches to more consistently secure than software solutions. The statistical risk for software security failure is orders of magnitude beyond hardware solutions because hardware demands rigidity and simplicty – both of which create effective security outcomes. My point is that flexibility for forwarding data frames is a silly idea. How many variations of forwarding a frame can be created ? How many will the marketplace accept ? 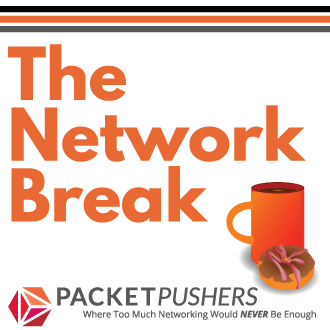 Does the Ethernet frame change often enough to need monthly software updates ? Silly. Software switching adds complexity and failure modes for insignificant gain while failing to address security, and ignoring that the extra load on the server side causes compound failure modes in the hypervisor OS. But, because software is cheap and easy, I suspect it will arrive anyway and we will spend the next twenty years working around the flaws. That’s how we ended with Ethernet instead of a halfway decent L2 network protocol. I guess we’ll have to agree to disagree on this topic. The datacenter is the most exciting and innovative area in networking right now and virtualization / cloud is one of the main drivers of all this change. The needs for switching in this environment will be different and continue to evolve over the next few years. This market is moving way too fast for the current solutions (both hardware and software) to be the perfect solutions. Will the frame format change in the future ? Most likely, yes, just as it has for the last 20 years. Different headers, tunnels, encapsulations, etc. Look at all of the proposals of IPinIP, MACinMAC, MACinIP, etc. coming out of academia to address datacenter. Until this area slows down as it matures, software switching allows the greatest flexibility to adapt without introducing the complexity of having different hardware versions throughout the network. So, how does tying a VM to piece of hardware scale? Are you asking how VMware scales a Intel CPU ? Guess not. That’s how a network scales on hardware and not in software. No, I mean, if you tie a VM to a particular NIC (virutalised) inside a piece of hardware, and then you want to move hardware, ie from Cisco to HP, this breaks the tenets of virtualisation. Even with SR-IOV and the like, the hardware vendor is responsible for providing a driver for your guest. I cant see a hypervisor vendor providing a universal NIC driver for every guest to make every guest talk to every virtual instance of a hardware NIC. Can Openflow provide the software flexibility and hardware performanceand scalability at the same time? In my view, yes. OpenFlow is a management and control plane technology that works by modifying the forwarding tables in the data plane. Although there are possible limitations as a control plane manager such as timing of read/write from devices, processing time, response to network conditions etc, these can probably be handled in software. Performance and scalability of the data plane (switching fabric and Ethernet interfaces) is determined by the silicon and hardware deployed and thus depends on your manufacturer.